MY FAKE BRIT ACCENT: the ghost of kc? |hello readers! (if there's any, heheh!). the following was originally an entry on my web site's "gigography" section. i kinda re-edited it for this blog. it happened during my first ever visit to seattle, wa in the fall of 1998. 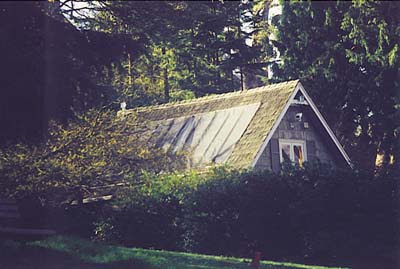 Sept. 31, 1998 Thursday - Around 7 am, my friend in Seattle, Rex & I went to visit Kurt Cobain's old house at 171 Lake Washington Bl. East in the Denny-Blaine district of Seattle..The house where he was found dead!. This is one spooky visit though...In the park adjacent to the house (Viretta Park), we were checking out the makeshift "Kurt's Park" memorial. There were 2 (or 3? I don't remember now) wooden benches which fans had written messages all over it, when suddenly the air was filled with this weird, "varnish-chemical type" smell. I tried looking for a possible source but couldn't find it. Oh yeah, I left my mark too; I just don't remember what I wrote, hehehe. I know for sure it had my signature "schizo". Anyway, after a while, Rex & I left and headed to the nearby Denny Blaine Park where we had parked our car. Rex didn't really know anything about Nirvana nor Kurt. He was asking me all these questions like, "what songs did they play? ", etc...Then the spookier part came! As we got back to the car, I immediately turned the radio on & tuned into Seattle's alt-rock station KNDD The End. "The Dope Show" by Marilyn Manson was playing as we were driving away. Rex was still asking me questions & barely 3 minutes away from Kurt's house, the next song that played was.....Nirvana's "Smells Like Teen Spirit"!!! 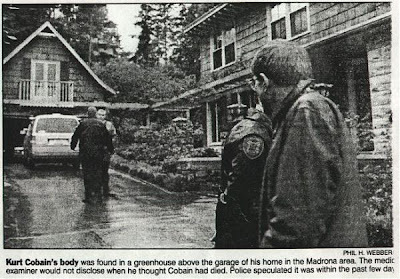 Was that a coincidence or what...or was it an actual haunting of the once popular rockstar named, Kurt Cobain? I dunno, you figure it out! PS. I visited that place once more in 2000 with my friends, Louie & Katz. No more weird smell though! Accdg. to zillow.com, the house is now worth a little more than $4.5 million. Wow! Not bad for a dead rockstar's house! schizo is a wanna-be: record label A&R, alternative radio music director, music journalist, publicist, live sound engineer, record label CEO, concert promoter, live concert photographer, DJ... schizo is a: massive music fan, concert taper, music & memorabilia collector... schizo loves: the moshpit, graffiti, b-boy/breakin' & DJ battles! U2 jacked up their concert ticket prices? to blog or not to blog?..yeah whatever! 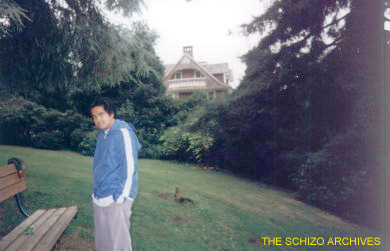 (c) 2010 The Schizo Archives. Awesome Inc. theme. Powered by Blogger.